Are you one of those people who’s Thanksgiving preparation actually starts early in the morning? 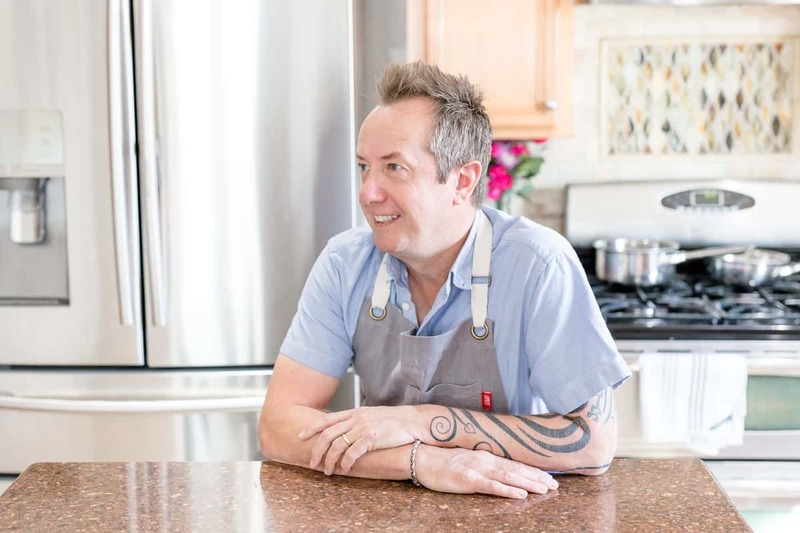 There’s always so much to get ready for the afternoon feast that breakfast can often end up getting the short end of the stick, but it doesn’t need to be like that. I’m all for making Thanksgiving an easy day. 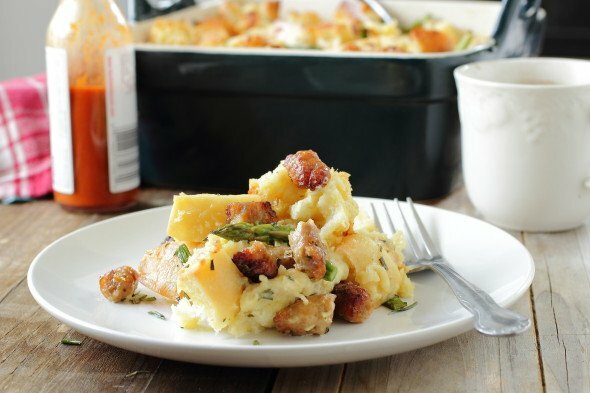 Prepare this sausage cheese asparagus savory bake the night before and all you need to do is chuck it in the oven after you make your coffee if you’re like me. Seriously folks it’s the first thing I do every morning. You could even head back to bed for an hour while the bread pudding is baking…if you don’t have an 8 year old and a 3 year old. If you do have said children, then yeah you’re getting up. But you could still use your time wisely and after typing out numerous “Happy Thanksgiving” tweets you could have the turkey resting at room temperature and water boiling for the potatoes. This bread pudding is packed with flavor but the deal sealer is the cheese. I used Kerrygold Skellig Cheddar. This is a sweet hard cheese which reminds me of a young Parmesan. It’s sweet but with a salty aftertaste and would be prefect in a pasta sauce, or even just grated on top like Parmesan. I added it in layers much like building a lasagna, this way you get to taste all of the flavors in every bite. Make the most of November 28, but be sure to start as soon as you open your eyes! 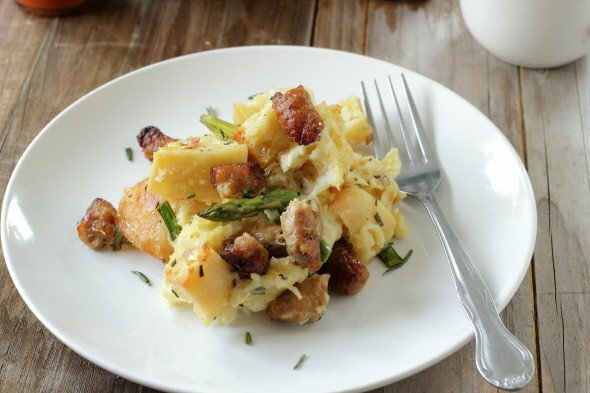 Make this sausage savory bake for a lazy Sunday morning! In a pan, heat the olive oil and cook the sausage. Transfer to another dish and set aside. In the same pan, add the onion and saute over a medium heat until the onion is soft, about 5 minutes. Add the garlic and cook for another 2 minutes. Season generously with salt and pepper. Add the milk, cream, eggs and rosemary to a large bowl and whisk until well combined. Mix the cubed bread into the milk mixture along with the onion, sausage and asparagus. Make sure to cover all of the bread in the milk mixture. Preheat the oven to 350 degrees F. Butter or grease a 9 x 13 baking pan or similar sized dish. Before baking transfer 1/3 of the mixture to your baking dish and spread out evenly. Sprinkle some of the cheese over the bread. Lay another layer on top and sprinkle generously with more cheese. Finish with a third layer of the bread mixture. Bake in the oven for about 50 minutes and the top is golden brown. Also check by inserting a sharp knife into the middle and checking for dryness. The center should also be springy to the touch. Let sit for 5 minutes before serving with additional grated cheese on top if desired. This dish could be made straight away and doesn't need to sit overnight, but try to let it sit and soak for at least 30 minutes if you prefer to cook it this way. Mmm! This looks so good! I have been on the look out for bread pudding recipes and this one is kind of perfect! This is definitely on our upcoming menu! Love that sausage, yum! Savory bread pudding needs to be in my life, love the idea of serving this for brunch! Anything that you can make ahead of time is a winner in my book. And this looks amazing….so much better than what I just ate for breakfast. Can’t wait to try it! 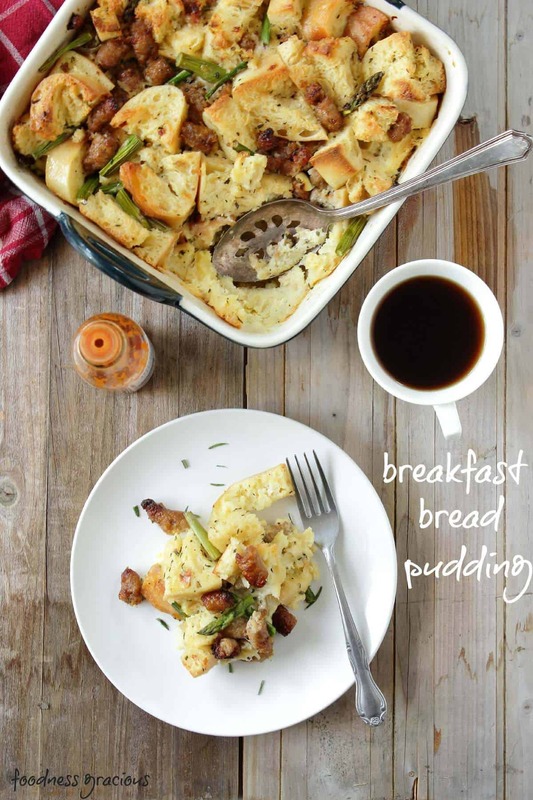 I love that you used crusty hunky bread – looks like an amazing breakfast and now I’m drooling – thanks so much! Can this be made in a slow cooker? . 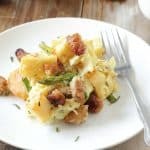 Most slow cooker bread recipes I have found say to cook on low for 3-4 hours…just wondering if that would work for this. We are having a “bake off” at work and I want to serve it warm but we don’t have an oven at work. Hi Angela, I wouldn’t recommend cooking it in a slow cooker even though it would probably work but i think it would lack the same texture you get using a reg oven, I fear it would be soggy and mushy. 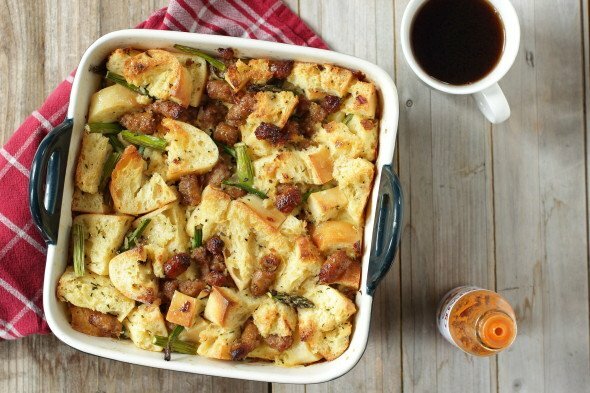 Could you cook it at home and get the crusty top and then keep it warm in the crock pot before serving? This bread pudding looks so good for Thanksgiving! Gina, I see what you mean. This could be eaten at any time of the day hence the preheating oven but I was so focused on making it a breakfast dish and that’s the reason for letting it sit overnight. I admit it’s confusing and I’ll go back and re-word it. I would still advise on letting it soak for about 30 minutes if it was going to be for dinner or lunch. My apologies.. Thank you for adjusting the recipe. We had it for lunch today and it was fantastic!